Marcela Gaviria survived a childhood cancer that nearly took her leg. She’s spent the last 30 years dealing with complications from that illness. And in all that time, she has stuck with the same doctor, Dempsey Springfield. Marcela and Dr. Springfield have lost count of just how many surgeries they’ve been through together. 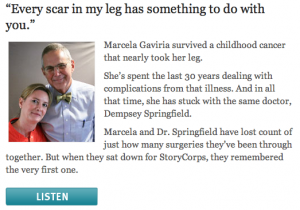 But when they sat down for StoryCorps, they remembered the very first one.